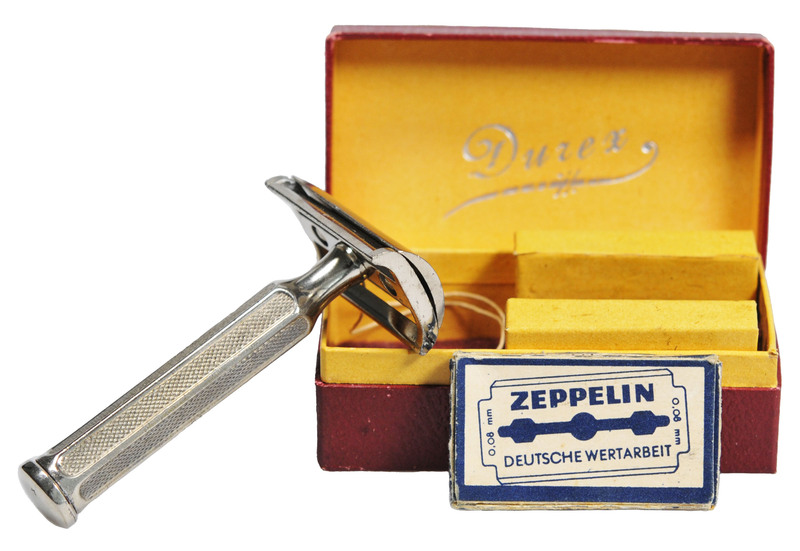 For all you history buffs here is a German Solingen head Durex safety razor that was part of the amenities package on-board the Hindenburg. These were given to every male passenger that traveled on the airship. This example seems to be in very good condition and is available in an upcoming auction. I have no economic or personal interest in the razor or auction but just point it out because of the history and my interest in Zeppelin's. This may not be appropriate to do but it is not eBay and will ask for forgiveness instead of permission. It is lot 3928 in the 150th Felzmann auction in early November. Nice looking razor! It looks a lot like the Apollo razor from the same era. Is it possible the Durex is a re-branded Apollo or Merkur? I think Durex is one of many companies that used this generic razor head for their razor. Usually paired a proprietary handle with it and their own blades. They did this with the SB head as here and with a slant head. Apollo and Merkur were two companies that did not participate in this for the most part and cast their own proprietary heads, I think. Totally cool! Thanks for sharing.